TX Barcode 3.0 will be released with the new version of TX Text Control this month. This barcode component for Windows Forms, WPF and ASP.NET has been improved with 9 new commonly requested barcode types. TX Barcode can be fully integrated into TX Text Control and the reporting engine MailMerge supports TX Barcode natively. TX Barcode has been specifically designed for the requirements when integrating barcodes into documents, such as invoices. QRCode QR Code is a two-dimensional barcode that encrypts up to 1270 ASCII values or 1850 alphanumeric values. By design TX Barcode switches encryption mode when necessary. AztecCode AztecCode is a two-dimensional barcode that encrypts up to 1300 ASCII values. Datamatrix Datamatrix is a two-dimensional barcode that encrypts up to 1301 ASCII values. PDF417 PDF 417 is a two-dimensional barcode that encrypts up to 1500 ASCII values. MicroPDF MicroPDF is a two-dimensional barcode that encrypts up to 250 ASCII values. Maxicode Maxicode is a two-dimensional barcode that encrypts strings of three digits, followed by '~', followed by three digits, followed by '~', followed by alphanumeric characters which are bounded by '~' or ???????????. Code128 Code128 is an alphanumeric barcode with high information density. Interleaved2of5 2 of 5 is a barcode that encrypts digits only. Code39 3 of 9 is a barcode that encrypts alphanumeric values. IntelligentMail Intelligent Mail barcode is a barcode type that encrypts postal zip codes and it the successor of Postnet. 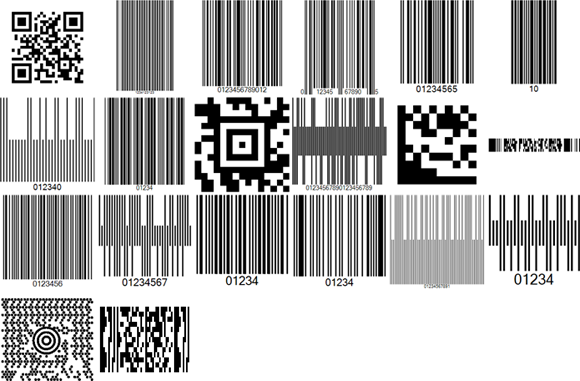 EAN13 EAN 13 is a barcode that encrypts 13 digits and is used for marking retail goods. EAN8 EAN 8 is derived from barcode type EAN13 and encrypts 8 digits. UPCA UPC-A barcode encrypts 12 digits and is very similar to EAN 13. Postnet Postnet is a barcode type that encrypts postal zip codes. Codabar Codabar is a barcode that encrypts digits and the characters '-', '$', ':', '/', '.' and '+'. FourState 4State is a barcode that encrypts 8 digits. Code11 Code 11 is a barcode that encrypts up to 50 digits. Code93 Code 93 is a barcode that encrypts alphanumeric values and the characters '. ', '$', '/', '+', and '%'. PLANET PLANET is a barcode that encrypts digits. RoyalMail Royal Mail is a barcode that encrypts alphanumeric characters and characters ')' and '(' .